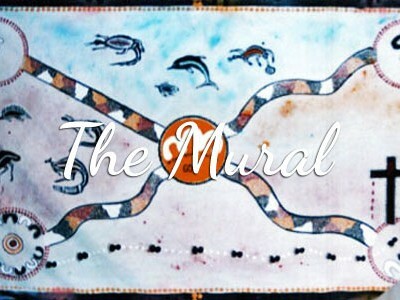 During NAIDOC week the children of the Logan Aboriginal Community Centre who attend Grove Christian College, and their parents and friends, created, painted and presented this mural to their school. 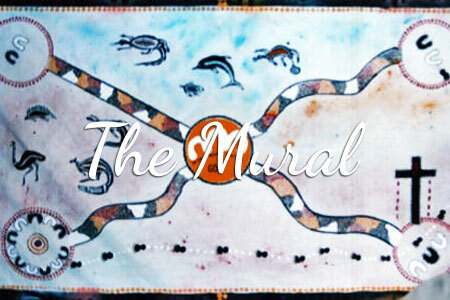 The Mural, which means ‘Story Picture’, represents God’s Word in a ‘nutshell’, created on 2 metres of canvas. In the beginning God made everything – sea creatures, land creatures, and mankind. God made everything in abundance and it was good! God and mankind had direct fellowship (straight line) and it was good! God calls his children to walk on now to fellowship with other Christians, to learn and grow. It is now possible for men and women of all cultures to be reconciled. But mankind must first be reconciled to God before they can be reconciled with each other. This is when there can be unity.